Enjoy the game with a unique view from the outfield! 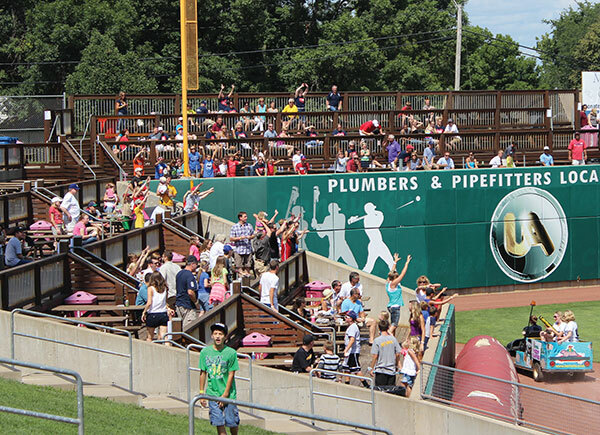 Located just beyond the left field wall, the Plumbers & Pipefitters Local 125 Pavilion gives fans a one of a kind view from the outfield. The Pavilion has four decks that can comfortably accommodate up to 600 fans. Children 5 and under are admitted free. Food and beverage is available for three hours starting 30 minutes before the scheduled game start time. A minimum of 50 people is required to rent the Pavilion, and a deposit of $300 is required per deck. The Closer ($28 per person) - ticket and unlimited food and beverage. Juicy 1/3 lb. hamburgers* & cheeseburgers, hot dogs, brats, popcorn, peanuts, choice of dessert, soda, bottled water and beer. Contact Andrea Brommelkamp at (319) 896-7603 (email: andrea@kernels.com) or Peter Keleher at (319) 896-7622 (email: peter@kernels.com) if you are interested in booking a group on the Plumbers & Pipefitters Local 125 Pavilion for the upcoming season!